I had a blast today! 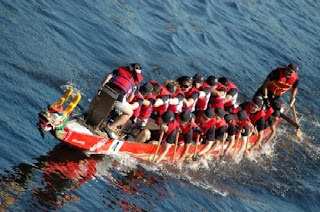 It was the 11th annual Dragonboat Races in The Woodlands! Have you ever been boat racing? Talk about an extreme arm workout! I had a blast though! The day's events entailed more than just boat racing. We participated in Human Fooseball, Volleyball with a solid net while bouncing in a bounce house, Dodgeball, Texas Snowboarding, and Name That Tune. I do have to admit that my behind hurts from sitting in the boat...but lucky for me, I have enough padding to keep it bearable...lol! Hope your weekend was fun! I still can't believe that I made it through today...I'm SO NOT the outdoorsy type, but I wanted to step outside of my norm....I'm glad I did! I.love.Fall. I don't know if it's the turtlenecks, cute designer jeans, the boots, or the fact that the humidity is gone in Houston, and my hair doesn't frizz...I just love it! While it's not completely Fall here, the temperatures are dropping, and I anticipate the change. Anticipation...that's a good word to describe this season that I'm in! I'm totally focused on my 90 day plan, and while the road is not always an easy one, I know the end result will be worth the blood, sweat, and tears. 1. I've switched my toe nail polish to a deeper pink that I love to bring in the new season...life changing I know...lol! 2. I started taking a daily vitamin, and it makes me SO HUNGRY...I don't know if that's a good or bad thing yet...I'll keep you posted! 3. I bought some really cute Christmas decorations, and I'm still searching for the perfect Christmas stockings! 4. I've started reading the Twilight series, and I had NO desire to...but I caved! 5. I joined a book club with some ladies from work...super pumped about that! 6. I'm in the process of completing my dream poster, destination 30! YIKES!!! I have about 13 1/2 months to go, so I better get busy! 2. My tongue is still one of the quickest out there...ugh! 4. I'm still very much so impatient! 5. Sometimes I seriously wonder how God puts up with me....thank you Lord! Changes are everywhere in my life, and I can only pray that they keep coming as part of the Lord's will! I'll write more later...maybe I'll include a pick of my cute feet...HA! P.S. My back has been hurting since Wednesday, so please say a prayer for me for God's healing! Just to let you know the seriousness, I took an 800 mg Motrin tonight, and if you know me at all, you know I NEVER TAKE PAIN MEDS!!! Goodnight...leave me a comment if you'd like! Ok..so since the last time I posted A LOT has happened! Remember I told you about my 90 Day Focus? Well, that is still going strong! Have you ever had so much to say, but can't get the words to come out right? Well, that's me today...I can't get my brain and my fingers to get on the same page! I can tell you this...I got a new car! The details behind this story are just amazing! Two weeks ago, I took my car into the shop because it was trembling. I expected a couple hundred dollars, and Froggy and I would be good to go. Well...that Tuesday, I called to see what the damage was, and got the "bad" news....$5500 motor replacement, or in the words of the technician...."it's time to get a new car honey...!" I have to admit...I started to panic...I mean, I was planning on purchasing a new car, but I wanted to wait until the new year..to get a "good deal." Needless to say...my attitude about the entire situation was less than ideal. I'm ashamed to say that for a moment, I forgot who was in control, and who allowed things to happen. I started to calculate gas prices, car notes, insurance on a new car...UGH! BUT GOD! He had a plan all along. To make a long story short, God was in this from the very beginning, and He couldn't have picked a better car for me. I still don't know why I waste my time worrying about the details of my life. God has my best interest at heart..I hope I start remembering that! I'll write more later, but I've got an early morning, and a late day!! !